Between 1980 and 1990, there were just a few studies on mindfulness. Around the millennium shift the research on mindfulness-based interventions started to grow exponential. In 2014 alone 773 studies were undertaken. The red lines show the academic journal publications that are included in the American Mindfulness Research Association (AMRA) database. The blue lines show results from a search of the term “mindfulness” in the ISI Web of Science database. 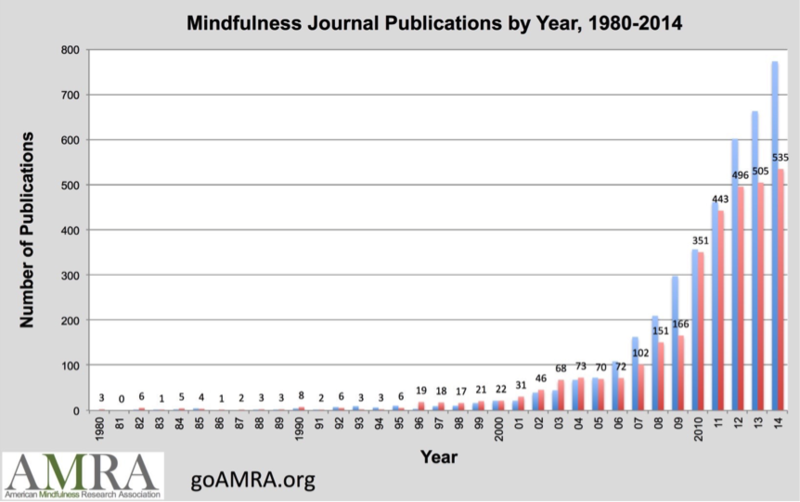 The term mindfulness is widely used and not all of the research in the blue lines is academic publications. (The figure is published with kind permission by David S Black at the American Mindfulness Research Association, www.goAMRA.org). Both the number of studies and the funding for studies keep growing exponentially.